Lionel Messi scored twice as holders Barcelona swept aside Stuttgart to reach the last eight of the Champions League with a 5-1 victory on aggregate. The brilliant Argentine smashed home a left-foot strike from 20 yards before Pedro slotted home after a square ball across goal from Yaya Toure. Messi then collected a neat flick, turned and found the net from distance. 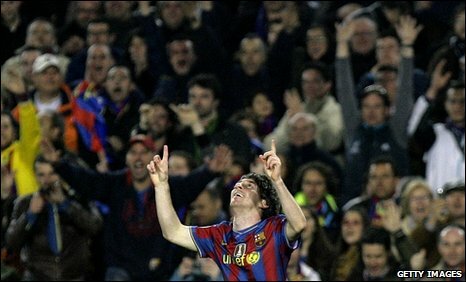 Jens Lehmann saved a Messi header, but could not stop Bojan Krkic from slotting home from the edge of the box. Messi was imperious on Sunday as he scored a second-half hat-trick against Valencia in La Liga - and he was the best player on the park by some considerable margin on Wednesday. But he was also part of a superb team performance by Barca, who even without the injured Xavi rarely looked threatened as they took another step towards reaching the final, which will take place at the home of rivals Real Madrid on 22 May. Will Barcelona retain their title? Stuttgart have improved considerably since manager Christian Gross took charge in December but his adventurous tactics did not work in Spain. The German side played with a very high defensive line, started with both Pavel Pogrebnyak and Cacau up front and looked to break forward with a level of ambition rarely shown by visiting teams at Camp Nou. Gross had stated the importance of starving Messi of possession and must have been concerned when the Argentine slipped a superb pass to Henry inside the opening minute, with the France striker forcing a save from former Arsenal team-mate Lehmann. And his fears were confirmed when Messi was allowed to advance from a deep position before unleashing the powerful strike that opened the scoring. Messi was given far too much space and time but nonetheless the momentary acceleration as several opposition players tried to close him down before he unleashed his strike was awesome. The goal gave Barca a 2-1 aggregate lead - and to their credit Stuttgart immediately went on the attack, with the home team perhaps fortunate to win a free-kick for a foul on Victor Valdes as they struggled to clear a goalmouth scramble. However, Barca tightened their grip on the tie when an incisive attacking move involving Messi and Toure carved open the German defence and allowed Pedro a simple finish. Pedro's goal came after 22 minutes - and Barca passed and probed their way to the break with ease. Henry, selected up front in preference to Zlatan Ibrahimovic, almost scored a third but was inches away from connecting with a low pass across goal from Toure. Stuttgart came out after the break with renewed intent but Barca, who take their place in Friday's draw, soon rediscovered their fluent passing rhythm, with Toure dragging a shot narrowly wide after he collected a pass from Messi. Barcelona's peerless Argentine, who had earlier been the victim of a heavy tackle from Zdravko Kuzmanovic, scored the third goal on the hour mark after a sumptuous build-up that involved Pedro and a backheel from Daniel Alves. Messi's strike from 20 yards was crisp but hardly ferocious. Nonetheless, it appeared to slightly deceive Lehmann, who should have done better. Midfielder Sergio Busquets limped off and was replaced by Ibrahimovic as Barca, adopting a 4-2-4 formation, continued to attack. Messi almost completed his hat-trick with a crisp header across goal that Lehmann saved with a dive low to his left, while Henry could not quite connect with an Alves header and Andres Iniesta had a shot brilliantly blocked. Despite his superb performance, Messi did waste one final chance to complete his hat-trick, missing the target with a dinked finish after skipping past two defenders. Bojan scored the fourth close to full-time with what may have been his first touch after he was played through by Ibrahimovic. "Every great has a tendency to influence his team, like Michael Jordan with the Chicago Bulls. He's the best. We wouldn't trade him for anybody. "To reach the quarterfinals is very important. We were very, very intense in all facets, very aggressive. We played a great game." "Barcelona are strong individually and collectively and I think the elimination of Real Madrid gave them some extra motivation. "Messi's ability is incredible when you consider his age. I think it's fair to compare him to Diego Maradona."